Cooked dinner last night, Moroccan lambs chops and spinach couscous. 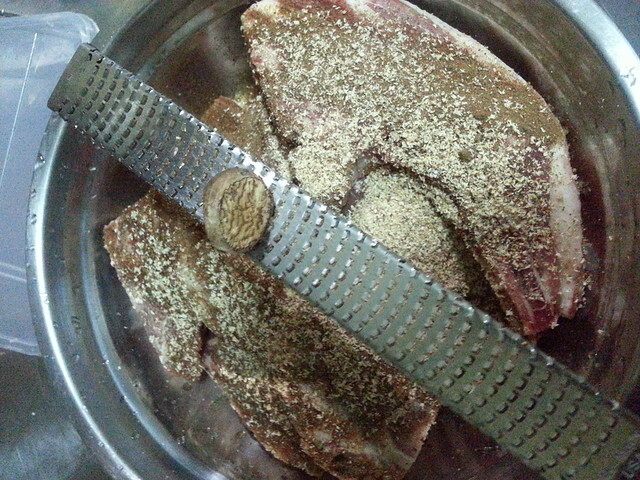 Dinner wasn’t planned, otherwise it would have been Moroccan lamb chops with yogurt, hummus and sultana couscous. Anyway, just want to say that anyone who cooks needs at least one Microplane grater. I’ve got three! Got them from ebay but you can find them pretty marked-up at specialty cookware shops. # – Snowing nutmeg on me lamb chops. It was so effortless to grate the nutmeg. Even to this day, whenever I zest lemons, I’m just filled with pure joy everytime because I don’t have to struggle! Microplane started out as a wood file, before thankfully moving into people’s kitchens all over the world. So yeah, you don’t want to put your finger to it. Next Microplane on my list….a mandolin.